Asus Chromebox-M004U is the brand new Asus mini desktop.. It is just the box without a screen, a keyboard or a mouse with connectivity options that will allow you to choose whichever devices you want to connect to it- including multiple and large screen monitors, wireless keyboard and mouse. It is very easy and quick to get started with the Chromebox and contains quite a robust 4th generation processor for your problem-free daily computing. 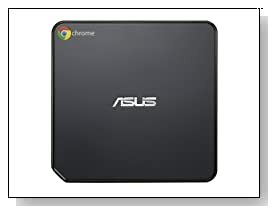 ASUS CHROMEBOX-M004U has the energy efficient Haswell Intel Celeron 2955U processor at 1.4 GHz speed for sharp and quick performance, 2GB DDR3 RAM for sufficient multitasking and a 16 GB Solid State Drive HDD to be able to start up in only seconds. You also have the 100GB cloud based Google Drive for your storage needs, all you need to do is to sign into your Google acccount. The operating system is the Google Chrome OS that provides safe internet browsing experience and although everything seems to be web based, you are able to use your apps and programs when you're offline as well. You may pick your screen at whichever size and are able to hook up to a couple of displays simultaneously through the DisplayPort and HDMI (including the latest HDTVs and monitors). The recommended displays by the manufacturer that are most suitable for the Chromebox are the Asus VE247H and ASUS VS228H models. But it is up to you whatever screen you wish to choose. You have the advanced Intel HD graphics card for optimal graphics performance. Chromebox is very compact- small and lightweight with 2.2lbs weight and the dimensions of 4.88 x 4.88 x 1.65 inches and handles VESA set up. You will soon see a special Chrome mouse and keyboard but the Chromebox is compatible with most available in the market anyway. You get nothing less than solid and reliable connectivity with the Chromebox .. An SD card reader to quickly access your saved documents and images, 4 x USB 3.0 ports to transfer data rapidly from USB drives and gadgets, 802.11 Dual-band Wireless-N to surf the internet smoothly and to stream high definition media, Bluetooth 4.0 to connect to other Bluetooth devices wirelessly, HDMI and DisplayPort. Conclusion: Asus Chromebox-M004U mini desktop is designed specifically for the best web experience, focusing mainly on speed and although pretty much everything is Web based with Google Chrome OS, you get a great variety of offline Google apps and work just as efficiently when you are offline. 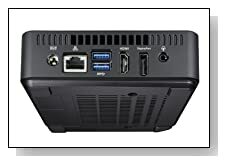 It is quite an exciting new model with a powerful processor, an SSD for fast overall performance and boot-ups, a good variety of connectivity ports, lightweight, small size and solid build at a super affordable price now.